The light on the left side gives off soft white light that suitable for working, while the light on the right side is a red signal light that would be quite helpful in emergency situations. The front light has two brightness levels, 1000 lumen and 400 lumen, to meet your different lighting requirements. 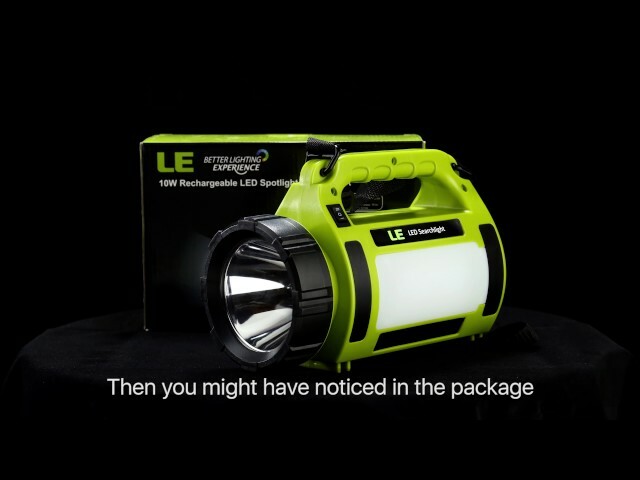 The front light can last up to 4-5 hours on a single charge. For the left side light, it has two brightness levels as well, including 130 lumen and 70 lumen. You can adjust its brightness to better suit your mood. The left side light can lasts up to 11-12 hours on a single charge. By adopting two qualified lithium-ion batteries of total battery capacity up to 3600mAh, this searchlight can be recharged by USB port, and it takes 5-6 hours to be completed charged. It has a large, comfortable handle as well as the optional, adjustable length shoulder strap, making it pretty handy when you go camping, walking the puppy or carrying an umbrella. You can also hang it on branches, nails, hooks via the strap, making it much more flexible. It has a row of blue indicator lights, showing you the battery level of the light. You are able to recharge the light timely when the blue indicator lights shows one drop of power left. Your area gets lots of thunderstorms and power outages? When there is no power due to a storm, you can count on this portable light as it’s able to light up your space and provide you with enough brightness. 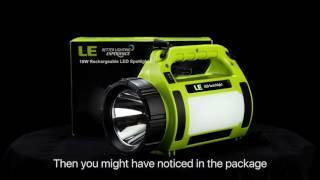 "Very impressed with this lantern, it is very light, and offers a powerful beam that shines a great distance. It is definitely worth the price." "Great value and I'm very satisfied with this purchase. I own several lights some of which are very expensive and I would choose this light over some of them due to the fact that the throw of this light is much more than some expensive lights and has great run time. Great product!" "Great light and super bright. Very light weight. My only complaint is that the two light modes aren't that different. The low beam is not much dimmer than the bright beam." As for your question, we don't provide charger for this light. Is this light 100-240v / 50/60 Hz? Want to plug it into a UK outlet, but need to ensure it's compatible, otherwise I'll need a voltage transformer. Thanks for your input in advance. As for your question, the light can be charged with the USB cable that included and the input voltage is 5V.